>Consider the gravestone shapes. Some of them are absolutely puritanical (just a rectangle of tremendous proportions), some are slightly embellished rectangles and others go for baroque. Instead of putting borders on an image, consider the image shape...and how does it go someplace from there. >Note that when drawn with a point, a picture goes from nice to mean and scary. Good point. Stick with the points...unless its a cherub. > Yesterday's fun with cut paper silhouettes manifested some cool stuff with drawn images. Work on that more. Do a spread of urns and a spread of either cherubs or winged skulls and see what happens. Could put the slash style on a better footing. More designed. Also, looks like some of the early Warhol advertising art. Look at that. >Work on more hand lettering. This is the stuff that can be integrated into the drawings. Type for the copy. > Excerpt blog for copy. Edit the crap out of it. > Write a nice acknowledgment to the two people who were the impetus to this work. Write a nice dedication to the home team. Design it as a sticker to print on the epson and can be applied to the book. >Work on line drawings of the willow. Marblehead cemetary had some nice references. Consider a willow spread with an urn knocked out of the pattern for copy. Could be pretty. >Consider using the mighty epson for a book jacket cover (that folds all the way into the spine of the paperback book). Consider drawing some intense sharp shapes to make a pointy/scary pattern. Remember the ribbon idea (thread it through 2 slits made in the book jacket cover (as the paper folds into the book) on both covers, and run the loose ribbon between the book jacket cover and the cover. The ribbon is only to be seen at the side of the book. Keep the ribbon either black (grograin) or a metallic pewter to maintain the one color job-bed ness of the piece. > Consider the square Lulu book. >Consider selling it via q.cassetti.com Why wouldn't people be interested in custom valentines ($20-$25)/ Goes beyond flowers, shows some intelligence and an ability to use the web? >Consider selling it on Esty. >Consider the folded "ice cream cone" shape that then could be a japanese accordion book type of thing. Gluing a piece of duplex board to the top and bottom single "ice cream cone" shape...could be cute. Maybe overly cutsy. > If its a book, what's the packaging? Can Lulu perfect bind a 24 pp. book? (they seem to work in signatures of 8 and 16). > Or do the book and repurpose the illustrations into a series of folding cards that are printed chez studio. > These projects are going to generate a lot of art. >Consider other uses for the art in addition to packaging the whole thing as a show (and having the pubs for sale along with giclees of the images (selected) from the show. Good thing this is a part time enterprise. That's the dump. Gotta get to Tburg early cause I have a meeting exactly at nine. Looks like a beautiful day. School is a week away. Yipes! Note: Willow Tree - Grief, death, earthly sorrow. Often carried at Masonic funerals, the willow is the tree of human sadness. 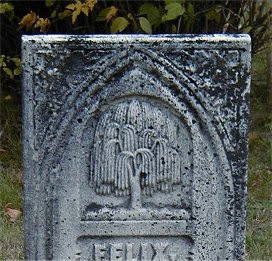 Interesting that the willow tree shown in the picture commemorates someone named Felix, which in latin means happy. If you didnt know it was a person, the juxaposition is good.